After my post on the best wireless Bluetooth speakers, I received a message from a reader that asked me if I could make another post on wireless Bluetooth products, but this time on the best headphones for traveling. I try to stay up to date on the latest and greatest when it comes to headphones because I’m somewhat a collector (according to my wife), so I thought it was a good idea. So how come I own so many pairs? Well, I don’t use the same pair of headphones for everything I do. I use one pair when I listen to music in the RV, one when I workout, one when I travel, one for music production, and one for gaming. Not all of them are over-ear headphones like we’re looking at today, they all have different features and uses. You don’t have to go crazy and buy several pairs as I’ve, one good pair can do the job. There are wireless headphones available that offer incredible noise cancelling and battery life, but there’s a lot more. All products I’m sharing with you today have built-in microphones. This allows you to take calls and on some of them trigger voice-assistants on your phone. 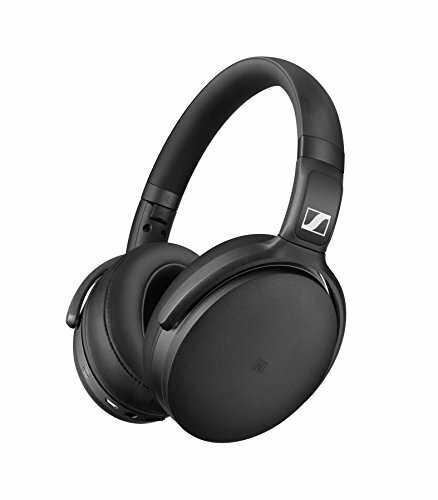 The noise cancelling functionality is useful if you travel or spend time in noisy areas. It lowers the background noise so you can enjoy your music or movies like you’d be sitting at home in quiet. The first time I heard the noise cancelling on my wired Bose QuietComfort 20, I was stunned. Suddenly, people talking next to me sounded really thin, like they were far away, and the music became extremely clear. Now I never fly without them, and sometimes I turn on the noise cancelling without any music so I can fall asleep on a plane. First out is this pair from TaoTronics. Model TT-BH22 has built-in noise-cancelling which can be turned on or off with a switch on the headphones. The noise-cancelling is not as good as the more expensive models from Bose and Sony, but it’s a good start and it’s a decent pair of headphones for the price. TaoTronics advertises an impressive 30 hours of battery life which can be extended by connecting the 3.5 mm audio cable when low on battery. Bluetooth requires battery power, so if you really need it to last for a long time and have the possibility to plug it into your phone, you should. The Bluetooth technology in these is 4.2 and will work great with all the latest phones and allow you to quickly swap between different devices. Controls on the headphones let you turn on/off noise cancellation, play/pause, volume up/down and next/previous song. Volume and song are controlled through the same multi-functional buttons. In the box you get a carrying case, a USB to Micro USB cable for charging, and a 3.5mm AUX cable. The TaoTronics TT-BH22 are a good choice of comfortable budget headphones with noise cancelling. The dual 40mm drivers deliver average sound and work best with bass-heavy music. If you run out of battery, you can plug them in with the included 3.5mm audio cable, but with 30 hours of battery life, it won’t need a recharge every day. With four different colors to choose from and adjustable fit, these will do the job for most people. Sennheiser is a well-known brand in the headphone industry. They make headphones with fantastic sound and incredible soundstages. One of their low-tier products is this HD 4.50 with noise cancelling. Just like with the TaoTronics, you can plug the included audio cable in if you’ve run out of battery or want to save battery. The battery itself is big enough to let you listen to 19 hours of music wirelessly. Other than Bluetooth 4.0, the HD 4.50 has NFC for instant pairing with supported devices. The built-in microphone will let you take calls and let you talk to your voice assistant through the headphones. Buttons will allow you to adjust volume, change tracks and manage your calls. The sound quality is above average with great bass. Remember that the sound quality on headphones are subjective, and the best thing to do is head to an electronics store and listen to the headphones yourself. In the box, you get a carrying case, a USB cable for charging, audio cable, and a 3.5mm angled plug. The Sennheiser HD 4.50 SE is a step up from the TaoTronics with better sound and noise-cancelling. It doesn’t offer the same battery life, but as long as you don’t need noise cancelling all the time, the included 3.5mm will let you listen for as long as your phone battery lasts. I recommend these for the music listener that wants balanced sound with clear highs. Next up are the ATH-M50xBT from Audio Technica. My wife bought their wired M50 model a few years ago, and while they had great bass and excellent sound quality overall, they hurt my big head and ears after less than 30 minutes. Unfortunately, these aren’t better in the comfort department for big heads. I just wanted to get that out there, so you’re aware of it. Other than the big-head issues, these are great headphones. They’re the only pair in today’s comparison that doesn’t offer noise cancellation, but they’re a very closed pair so while listening to music they shut out a lot of background noise due to their design. I know it’s a post about noise cancelling headphones, but I just had to add these to the list. 45mm large-aperture drivers deliver deep bass, and I recommend these for people that listen to a lot of bass-heavy music. They have an impressive frequency response at 15 – 28,000 Hz. Where the Audio-Technica ATH-M50xBT sticks out is with its battery life. 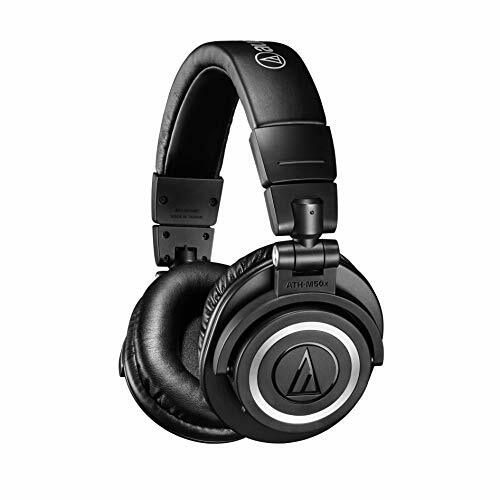 Audio-Technica advertises up to 40 hours of continuous use on a full charge, which means that you can wear them for several days before you have to plug them in. A 3.5mm audio cable is included for when you’ve run out of battery. The built-in microphone will let you use voice-assistants and handle calls, and the buttons will let you control music playback and volume. So who are these headphones for? If you don’t necessarily need noise cancelling and battery life is what matters, these will do the best job out of the headphones looked at today. With incredible frequency response from two large drivers and the built-in microphone to handle assistants and calls, this pair is perfect for the traveler on the ground. Now we’re getting to the headphones that have noise cancellation that I recommend if you’re a traveler by air or spend a lot of time in noisy environments. Beats headphones have gotten a lot of flak over the years for being overpriced and not sounding as good as one would expect from the price tag. In the past years, I have to say that they’ve improved a lot, and now they’re up there competing with the brands more known as having great sound-quality. But it depends on who you ask; there are negative opinions on every brand out there. The Studio3 offers noise cancelling and up to 22 hours of battery life. A nice feature to have is what Beats call Fast Fuel. It makes a 10-minute charge last for 3 hours. The included audio cable will keep the music going when you’ve run out battery power. Since Apple purchased Beats back in 2014, they’re a big part of the development of the latest Beats products. It became very apparent when Apple announced that the Beats Studio3 would include the Apple W1 chip. The chip that is also found in Apple’s wireless AirPods lets the user quickly connect to iDevices by merely holding the headphones close to the device. I have a pair of Airpods, and the technology has worked flawless, it lets me switch between my iPhone and iPad without going through Bluetooth settings. I’ve been waiting for more products to get access to the W1 chip, but for now, it can only be found in Apple and Beats products. Overall, the headphones are comfortable to wear due to the flexible fit. The drivers deliver heavy bass, with crisp mids and highs. For audiophiles, the bass might be too heavy and not balanced enough. The noise-cancelling is better than #1-#3 but doesn’t get to Bose and Sony levels. The Beats Studio3 are available in 10 different colors. If you’re looking for the best noise cancelling wireless headphones available on the market today, these are it. 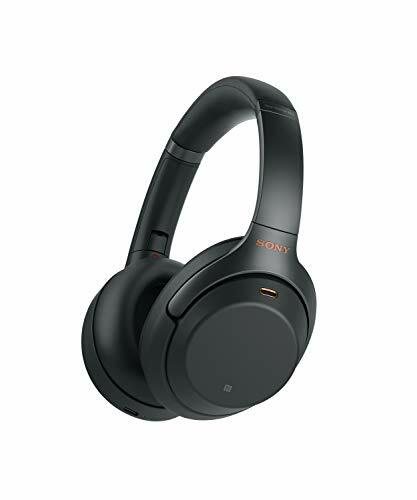 The Sony WH1000XM3 offer incredible (yes, even above Bose) noise cancellation with intuitive controls and features. 40mm drivers deliver balanced sound that sounds great in all genres, but in my opinion, they shine the most when listening to acoustic music. Touch sensors on the side let you control play/pause, next/previous, volume and voice assistants. It’s a little bit tricky to understand the controls in the beginning, and if you prefer physical buttons, these might drive you nuts. A feature called Quick Attention Mode lowers the volume when you place your hand over one of the ear cups so you can have a quick conversation or listen to an announcement. This mode will only turn on when the ear cup is in contact with skin, so it won’t happen on accident when it touches a pillow, for example. With all of these features, you’d expect the battery life to take a hit. The fact is that it’s second to best on that list, with up to 30 hours of battery life. If you do run out of battery, a quick 10-minute charge will give you an additional 5 hours of playback, so you’ll have to try hard to run out of battery on these. You can pair them to your device with both Bluetooth and NFC. Sony WH1000XM3 charges via USB-C. An app lets you control the sound and EQ. In the box, you’ll get a carrying case, a USB-C charging cable, and an audio cable for wired connection. 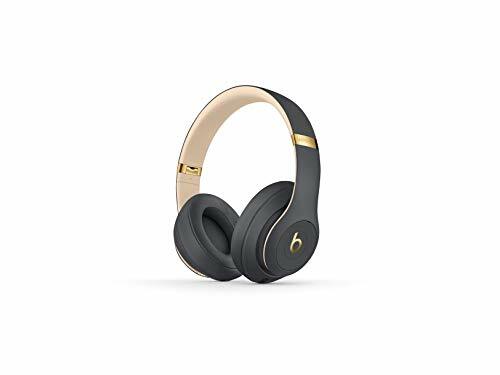 The comfort together with the noise cancelling make these the best headphones you could buy today if you travel by air or spend a lot of time in noisy environments. While the sound quality is excellent on its own, a big part of the price is for the noise cancelling technology. If you like the Bose-sound, the QuietComfort 35 Series II won’t disappoint you. 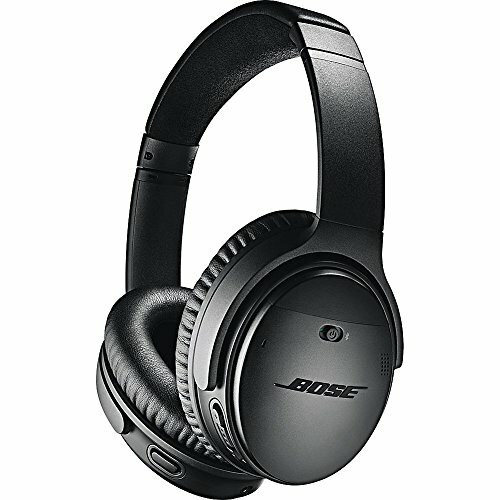 Noise cancelling products from Bose have been the leader for the longest time until recently when, in my opinion, Sony has taken over. These pair to your devices via Bluetooth or NFC, and has the smart assistant from Alexa built-in so you can request information and music directly through the headphones. The dual microphones make sure Alexa hears you, and let you have clear calls in noisy environments. The battery lasts for up to 20 hours which is 40% less than the Sony above. If you want the headphones to last longer, you can plug in the included audio cable; this will disable Bluetooth which will increase the battery life to up to 40 hours. Two things I’m missing from the QuietComfort 35 Series II are better battery life and a USB-C port. They do charge pretty quick, but not as quick as Sony. Micro-USB is not a port that lasts forever, and in 2018, it’s all about USB-C. So why would you get these over Sony? Well, it depends on if you’re a fan of Sony or Bose sound quality. I recommend heading to a store where you can listen to both of them and make up your mind. I like my Bose earbuds, but I don’t feel like the sound on the QuietComfort reaches the same level. Therefore, I prefer Sony when it comes to over-ear headphones. If you ask the next person, they might say the opposite — anyway, enough rambling. What the Bose QuietComfort 35 (Series II) does better is when you use more than one device, it has been more effortless for me to swap between devices with the Bose compared to Sony. Last but not least, a nice feature is that there are three levels of noise cancelling on the Bose that are easy to switch between with the buttons or Alexa. In the box you’ll get a carrying case, charging cable and an audio cable for wired connections. An app on your phone lets you control settings and the EQ. When you start traveling with noise cancelling headphones, you’ll never be able to travel without them again. They make airplane rides bearable, trains quiet, and let you enjoy your music and movies to the fullest. But there’s more to headphones than noise cancelling. Great sound quality can bring out elements in your favorite songs that you’ve never heard before. Days worth of battery life will let you travel many miles without worrying about a charge. Intuitive controls will be there when you need them, and never be in the way. And the most important thing, a pair of headphones will only be as good as their comfort. If you can’t wear them because your head starts to ache after an hour, the fancy features and long battery life won’t matter. 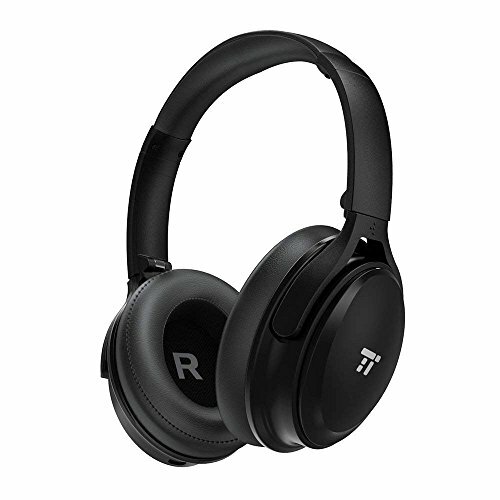 Good: TaoTronics TT-BH22– When you need wireless headphones to listen to music and take some calls, the TaoTronics TT-BH22 will do the job. The battery life, comfort, microphone, and the bass is all there. For most people, this is all they need. Better: Bose QuietComfort 35 (Series II) – Bose was the first company that showed me what good noise cancelling means. Their QuietComfort 35 Series II is a great product with great sound. Best: Sony WH1000XM3 – It’s impossible to talk about these without mentioning the noise cancellation. Together with the sound quality, 30-hour battery life, and comfort, it makes these the best wireless Bluetooth headphones available today. They’ll give you the whole experience of a song or movie, and other companies are working hard right now to beat these. Can I use noise cancellation when my headphones run out battery power? First, we must know that there are two kinds of noise cancellation, active and passive. In most new headphones, the noise cancellation is active, which means that it’s actively reducing frequencies. This uses battery power, so the answer to the question is: No, when the battery runs out you can’t use active noise cancellation. Can I turn on noise cancellation without having any music or movie playing? Yes, you can use noise cancelling headphones as earplugs to shut off noise around you. I use my headphones on airplanes this way. There’s a small microphone on headphones with active noise cancellation. This little microphone analyzes the noise in the environment around you. Then a circuitry in the headphones looks at what frequencies the noise is in, and emulates a sound to cancel out those frequencies. Will other brands use Apple’s W1 chip in the future? Apple hasn’t shown any intentions that they plan on allowing other companies to sell products with a W1 chip. We can only hope that they open up and more products are released with it.